Check out the official wrap-up from the organiser. I managed to get one of my pictures in there – woo hoo! MINI alert! 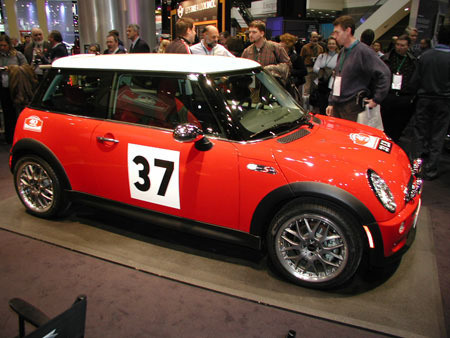 Two new MINIs have been spotted in Brawley, a red and white, and a white and black, both base versions. Teri knows both families who owns them and I shall be trying to recruit them to SCMM just as soon as I can find the business cards I was given for them. A little bit of Bully! The XM radio rocked! Only a couple of dropouts the entire trip, always something to listen to on some channel somewhere. Local radio stations are history as far as I am concerned. [NB though that the new Kylie album is currently occupying my listening pleasure]. I received a lot of compliments on how Sarah looked which surprised me. Sure she looks great but amongst all the other custom-decal’d MINIs I was thinking no one would notice her. Several people thought that my John Cooper signature decal meant I had a JC Works kit installed. I wish I did! I also got asked how I got the flag decal on the sunroof as many people have been told this is not possible. Well, it was on there when I bought it but my mathematical training says that my MINI proves that it is possible so go back to your dealer or decal shop and tell them to try again. Vegas is not a lot of fun to be in on your own. Outside the runs and meals, it was kinda lonely. Hopefully Teri can join me next year. And the Stardust hotel is too low end to be worthy of much people-watching. I was surprised by how much animosity we met driving up the Strip late at night. I heard and observed many more insults than compliments. And it was too bad that we couldn’t keep more together, I think most people wanted just to show off their speed (such as could be done in stopped traffic) rather than have 3 lanes of 30 MINIs together. Now that would have made a picture for the newspapers. More picture links: DB’s Vegas gallery, Ray Ibanez from Mighty MINI and fellow SCMM’er Jenn Tanzer. First, we have the limited edition MC 40, of which there will be only 1000 made. See the article about the press introduction for more details. 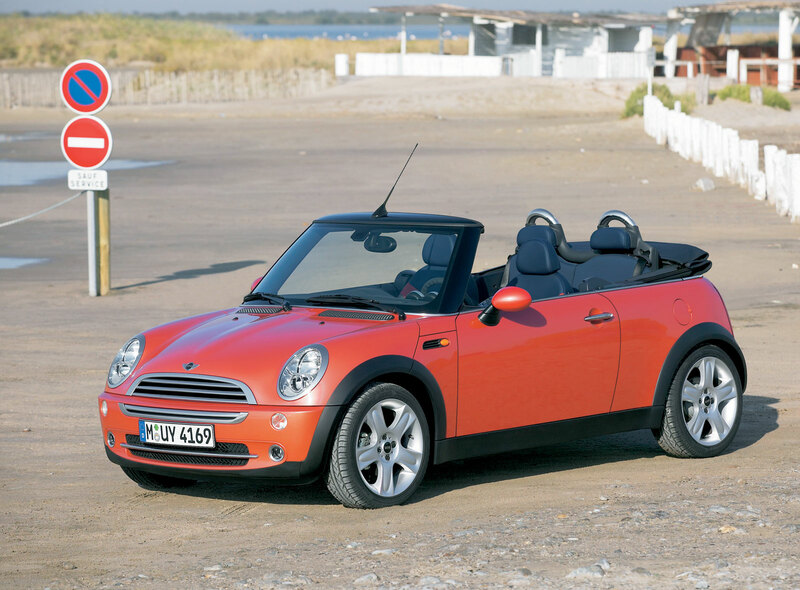 Next, we have the new MINI Cabrio which will be officially viewable March 1st at the Geneva car show. For all the details check out this article and the MINI Cabrio website. At least 100 MINIs hit the Stardust Hotel for the MINI Vacation in Vegas last weekend. A special roped off area of the car park was designated MINI only and it was quite the sight seeing so many MINIs already there when I arrived. Events over the weekend included a delicious buffet at the Aladdin Hotel, scenic runs to nearby state parks and a late night cruise up the famous Strip. There is something very cool about being amongst a group of MINIs racing up the freeway or racing up the ramps in a hotel car park (!). Lots of people were taking pictures, including myself, and I will post links to some of them when I find them. I am sure Juan and Don will have some good ones to look at. But in the meantime you can check my pictures out right here. Other than driving and eating I did a little gambling on the slot machines and to my delight won almost $500, including a $400 jackpot on one machine, whilst only spending about $50. Not a bad little earner, I think. More thoughts and reflections on the whole thing over the next few days.